I haven’t been a fan of tower defense games very much, I’ve found them a bit dull and repetitive sometimes, and there’s far too many of them. But Defense Grid has very much hooked me in and is proving to be a lot of fun, and at 800 MS points (or about 7 or your Earth pounds) it’s an absolute bargain. I think one reason I like it is that there’s no tower damage. Your towers are effectively invincible, which may not be realistic, but it does mean that it makes the game entirely about planning, strategy and resource management. Some tower defense games don’t realise that it’s supposed to be a strategy game, and put all sorts of extra mechanics like enemies attacking and destroying towers etc, but this undermines the core planning game mechanic, turning it into a game of how-fast-can-I-repatch-my-crumbling-towers-if-I-even-get-time-to-notice-at-all. In Defense Grid and other TD games with no tower damage, you succeed or fail based on how well you plan - how you set it up, how you augment and supplement your towers as time goes on (which you should have thought out ahead of time), and watching it play out according to your will, or fall apart because of it. There are no random elements - it’s a little like Chess, and I think that’s a good thing. I also like what they did with the fail conditions. Instead of stopping creatures getting to a map end point, you have to stop then nicking ‘power cores’ from your reactor and making it off the map with them. 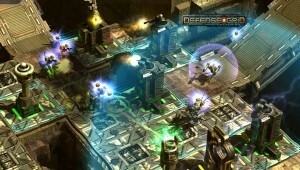 The catch is that when you kill an enemy carrying one, it floats slowly back to the reactor, and can be picked up by another enemy, creating the danger of a ‘relay race’ where a really tough enemy can make it through your tougher defenses, and even if they can’t make it all the way back, swarms of weaker enemies can potentially relay it if you don’t take them out fast enough, thus requiring a balance between defending against single tough enemies and lots of small enemies, and stopping you from lazily relying on one primary ‘choke point’ - because the ‘relayers’ might not ever have to cross it if another enemy already took all the damage getting through it. It’s a cunning design idea that works really well. It looks great too, which helps. And the control system works perfectly on a control stick, which I didn’t expect. And the mechanic of being able to redirect enemies via longer paths with sensible tower placement, and how you can screw it up if you force them to breach this, is good. Highly recommended even if you’re not usually a tower defense fan, or perhaps especially if you’re not.